Sunday saw Dover Rowing Club in action on the River Medway in the Maidstone Autumn Head. 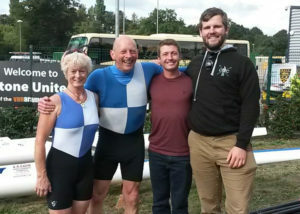 Dover entered 4 scullers in the competition, Chris Price, Robin McCorkell, Nick Bailey and Jo Johnston. With Dover rowing in their shorter, heavier coastal sculls it was always going to be a challenge racing against the sleeker river boats, but as Price and McCorkell lined up in consecutive places in the Men’s Novice event they were determined to give coastal rowing a good showing. Price started first in the race’s time trial format and started hunting down the rower ahead of him. By the first bridge he had closed on the Gravesend sculler ahead of him and had stretched away from McCorkell. The diminutive Price showed his experience as he passed both the Gravesend and the Globe rowers ahead of him by the 2nd bridge where he easily dealt with the challenging dog leg before laying down the power to finish in 10 min 34 sec. McCorkell in his first outing on the Medway was a little more tentative but caught the Gravesend rower and was closing on the Globe rower who started three time slots ahead of him to finish in 10 min 49 sec. Price’s time was good enough to place 3rd with McCorkell 4th in a competitive division. Had Price been in a river scull it is likely he would have been competing for the win. Veteran rower Bailey was entered into the Masters F1 category and found himself in the same division as Johnston the sole entrant in the Ladies Novice. Bailey was two time slots behind Johnston and he tried to chase his younger teammate down. Johnston pushed hard to maintain her lead over the wily veteran and by the second bridge it was clear that Johnston was holding her own with Bailey only managing to close the gap slightly. By the end of the course Bailey had moved to 2nd in his category with a time of 11 min 35 sec and Johnston, the defacto winner of her category, finished in 11 min 45 sec; 3rd amongst the adult women rowers beating a number of intermediate rowers on the day.